One of the essential elements of the German military doctrine of the Second World War (widely popularized as the ‘Blitzkrieg’) was the excellent and continuous communication between military units. To meet this requirement, the German army built a variety of specialized vehicles intended for maintaining communications, such as the Sd.Kfz.251/6 half-track, Pz.Bef.Wg. III command tank, or Kfz.67a, later known as Sd.Kfz.232 (6-rad). This armored car was the command version of the Sd.Kfz.231 6-rad (earlier known as Kfz.67) and was produced mainly in C.D. Magirus’ workshop. In the second half of the 1930s (the exact year is unknown), Magirus converted some of its command vehicles into even more specialized cars, improving their communication abilities, at the expense of their fighting abilities. The new vehicle was called Kfz.67b. The number of cars built was very small – some sources (for example, the military historian David Doyle) claims 28 vehicles, while others (for example, www.kfzderwrmacht.de), have a lower claim with only about 12. The production of this 6-wheeled car was stopped in favor of 8-wheeled cars that got the same numbers in Sd.Kfz. classification (231, 232, 263). In 1937, when the new Sd.Kfz.263 (8-rad) was introduced, the Kfz.67b name was changed to Sd.Kfz.263 (6-rad). It was named according to its role: Panzerfunkwagen (eng. 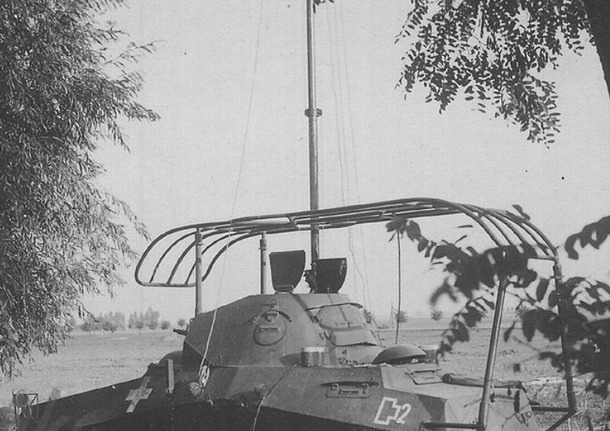 armored radio car) or Funkspähwagen (radio observation car). The Sd.Kfz.263 6-rad (not to be confused with the later Sd.Kfz.263 8-rad) was required mainly for the sustaining of communication, not for actual fighting. As such, Magirus removed its weapon – a 20mm KwK30/38 gun – to make more space for radios and their operator in the turret. The only weapon of the modified car was a 7.92 mm MG 13 machine gun which replaced the 20 mm gun in the turret. On the left side of turret (that was previously the place for the machine gun), a small observation hatch was placed. Also, the whole turret was welded to the car’s hull, and the turret rotation system was removed. As the turret was set fixed, the cantilevers of the huge frame antenna (known as “mattress”, ger. “matratze”) were simplified from a tripod to two legs. Also, the shape of the antenna was slightly changed. Thanks to these modifications, space for a radio and its operator was made. The new radio was a 100-watt FuG 11 SE 100 (or Fug.Spr.Ger.a, that was also used in the Kfz.67a – probably both types were used in Kfz.67b, depending on which specimen). It had a 50 km range for transmitting in Morse code, and 10km range for phone connection. To improve its abilities, the Kfz.67b had an additional straight antenna in the turret – this antenna could have been pulled in and out if necessary. However, it was usually covered under the hood. All vehicles were built on the Magirus chassis (all producers of 6-wheeled armored cars had their own suspension versions which differed in details) called M 206p. Characteristics of this suspension were: a frontal axis which receded a little, small casters before the second axis (which helped to pass obstacles), and side skirts between the frontal wheels and the engine’s part of the hull. Also, the back tow-hooks were placed slightly lower, and fenders had longer front parts than in other versions of the chassis. All these details were characteristics of Sd.Kfz.263 (6-rad). The vehicle had a six-cylinder S 88 engine (70hp) with five gears: four forward and one reverse. As the war unfolded, these vehicles were updated, but exactly when these modifications took place is unspecified. Modifications included: the MG 13 machine-gun was replaced with the MG 34, frontal tow-hook added, and Notek headlight added. The only external characteristics that showed, telling the difference between 6-wheeled Sd.Kfz.263 and 232, are the single machine gun, a straight and short antenna on the turret, and the two-leg mounting of the frame antenna with ‘8’ shaped central part. From 1935 to 1940, the six-wheeled armored cars were used by reconnaissance units in motorized, light, and armored divisions of the Wehrmacht. Three armored divisions were planned to use 22 6-rad armored cars, including 12 in a reconnaissance battalion. It is known that one battalion used two Sd.Kfz. 263s. This setup for reconnaissance battalions was approved 1st September 1938 (and was still in operation during the invasions of Poland and France) for 1-5th and 10th armored divisions in addition to the 1st and 3rd light divisions. Also, the 2nd light division had 4 companies of armored cars. However, six-wheeled cars could have been supplemented in all setups by eight-wheeled armored cars that had the same classification numbers. So the number of 6-wheeled cars in use was smaller than it may seem. Illustration of the Sd.Kfz.263 6-rad ‘Peterle’ produced by Jarosław ‘Jarja’ Janas, funded by our Patreon campaign. Another photo of Sd.Kfz.263 (6-rad) in Poland. The white cross is painted only in outline for camouflage reasons – this was a common practice. Photo: World War PhotosSd.Kfz.263s were used – as were other 6-wheeled armored cars – during the annexations of Austria and Czechoslovakia. As these vehicles were fast and impressive-looking, they were one of the first armored vehicles that entered occupied countries. They were also often used in propaganda and parades. However, during the Polish September Campaign (1939), 6-rad cars suffered mechanical failures, as they had problems off-road and on Polish roads, which were often of very poor quality. To make matters worse for the invaders, armored vehicles were easy prey for anti-tank rifles and cannons. As such, 6-rad Sd.Kfz.231s and 232s were withdrawn from frontline duties to policing or training units after the invasion of France (June 1940). However, Sd.Kfz.263s (6-rad) were still in use (as its limitations were forgivable for vehicles destined mainly for communication, not fighting). These armored cars were still in use in 1941 during the Balkan Campaign and in Operation Barbarossa. However, after the invasion of the USSR started, Sd.Kfz.263s (6-rad) were no longer used. Kolekcja Wozów Bojowych magazine, nr. 23: Sd.Kfz. 231 (6-rad), Oxford Educational sp.z o.o. We have not seen any proof in that direction.